Hawkfish are members of the Cirrhitidae family, which contains approximately 12 genera. Hawkfish are a commonly kept group of fishes due to their bold personalities, relative ease of care and bright coloration. The Flame Hawkfish (Neocirrhites armatus) is one of the most commonly available hawkfish species. Other species frequently sold in the aquarium hobby include the Longnose Hawkfish (Oxycirrhites typus), Falco Hawkfish (Cirrhitichthys falco) and the Arc Eye Hawkfish (Paracirrhitus arcuatus). Hawkfish are found exclusively in the tropical Pacific and Atlantic Oceans. They can range in size from 2.5” (7 cm) to about 24” (60 cm), however most species mature on the smaller side of that range. The largest species, Giant Hawkfish (Cirrhitus rivulatus), is often caught for human consumption because of its large size. Hawkfishes earned their name from their behavior of perching atop coral colonies, rocks and stinging hydrozoans to watch for passing prey items. Hawkfishes can msaltake great aquarium inhabitants, provided their husbandry needs such as diet, water quality and tank space are met. They are known to be boisterous fish, so it may be advisable to keep hawkfish with species of similar size and temperaments. Most hawkfish prefer a temperature range of 72F (22C) to 80F (26C). Hawkfish are generally considered reef safe as they will not harm corals, however they are known to consume small ornamental shrimps. 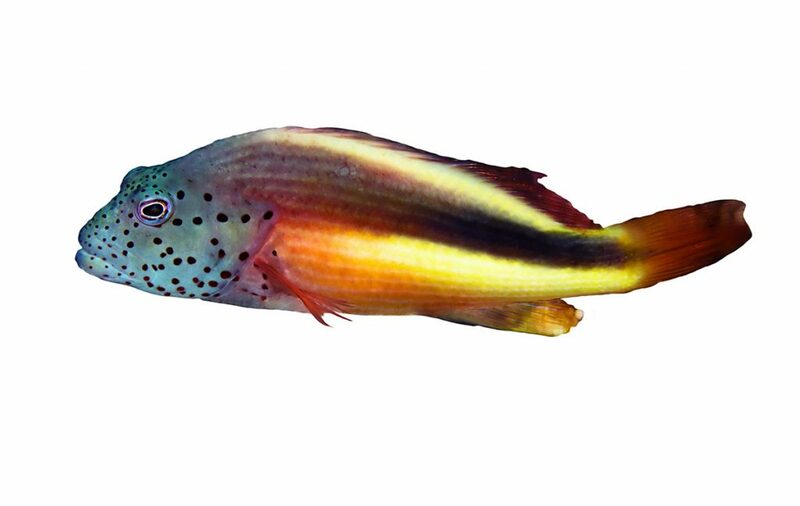 It is important to consider carefully what species of hawkfish may be best for your aquarium. While smaller species such as the Longnose Hawkfish (Oxycirrhites typus), are suited to tanks as small as 30 gallons, larger species such as the Giant Hawkfish (Cirrhitus rivulatus) will require a much larger aquarium.